When was the last time you did something new and completely different? Break the mold of your typical night out routine and bring it to the edge. Come out and celebrate Bad Axe Throwing as we open up our newest location in beautiful San Francisco with our FREE open house! TIMES: Visit us when you can this weekend, we’ve got multiple hours to make it easy for you! COST: Nothing at all, it’s totally FREE! RSVP: On our Facebook page. This isn’t just an ordinary party…this is the launch of something you’ll want to be a part of. We’re bringing the great sport of axe throwing to San Francisco and inviting everyone in the city to help us celebrate. At our open house, our talented coaches will teach you the art of axe throwing, including the proper technique so you can hit a bulls-eye every time. You’ll also have the opportunity to sign up for our exclusive axe throwing league where you’ll get to participate in championship tournaments. We’ll give you a run-down of the safety rules because we know it’s important you feel fearless whipping sharp blades at a wooden target for the first time (trust us, safety is our number one priority). If you’re looking for a new activity that tests a skill you may not even realize you have, axe throwing is for you. It’s also a great way to meet new people! 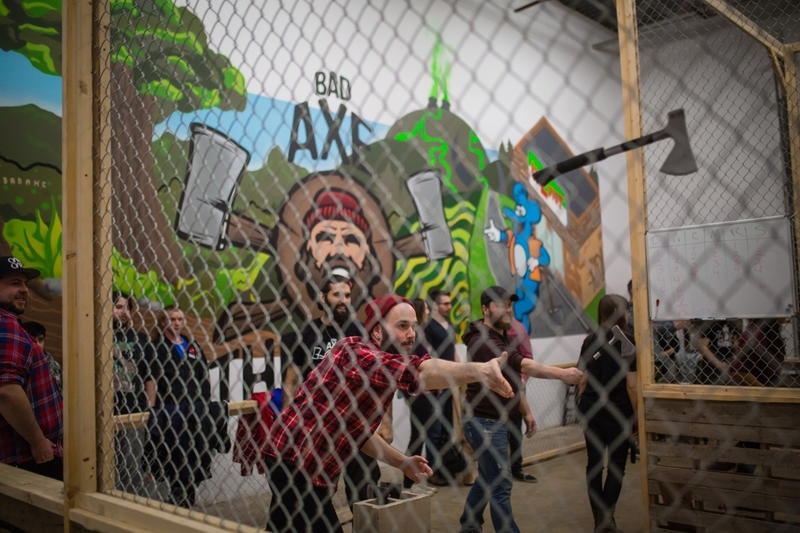 Bad Axe Throwing is a Canadian based company, so you can feel confident that we’re experts in all things axes and lumberjack, not to mention that we’ll provide a fun, friendly environment, of course. We’re the kind of folk that enjoy a good ol’ fashioned party and when you book a session with us, you can even bring your food and drinks! Nothing sweeter than sipping a few cold drinks with your friends while chucking steel blades at the wall. Bad Axe Throwing has multiple locations across Canada and we’re quickly expanding into the great U.S. of A. including Chicago and Indianapolis and now San Francisco! While we aren’t people who usually brag, we should also let you know that Bad Axe Throwing is the highest ranked and largest axe throwing business in the world. It’s our mission to bring this incredible sport to as many people as possible and we’ll on target to reach that goal. We’ve been featured on CNN, ABC, BuzzFeed and more. You can be certain that you’ll want your first axe throwing night out to be with us. There’s a lot of admirable companies in San Francisco and we feel axe throwing provides the kind of casual environment where you can really relax, unwind and de-stress from the pressures of the office. It’s also a unique team-building activity where people can bond during friendly competition and support each other through our coach-led challenges. Many executives from renown tech companies have brought their teams to our venues and made axe throwing sessions a regular occurrence because of the camaraderie it’s helped foster among their employees. Bad Axe Throwing was founded in fun and invented for people like you to celebrate any occasion in a truly unique way. Forget a bar or restaurant, axe throwing is a great option to get your friends and family together doing an activity that anyone can enjoy, regardless of their skill level. Whether you’re thinking of hosting your next birthday party, bachelor/bachelorette party, corporate event or even divorce party, our staff will help you coordinate all of the details. We can help you set everything up and provide you with local food and drink vendors, or if you prefer, you can bring your own homemade food and drinks. Every group session has access to their own space that you can decorate the way you like. It’s important to us that we ensure you have all the support you need to make your party a memorable one. We’re proud to be a part of San Francisco’s business community and we hope you’ll come out to give us a proper welcome at our open house. Dare to do something different. We promise you won’t regret it! We’re already starting to book corporate events for the second week of July and the response has been overwhelming. We look forward to brining axe throwing to Northern California!